Sometime between the hours of darkness on Sunday, 14 March and the morning of Monday, 15 March an explosive device was placed under the car of Rosemary Nelson, a solicitor in Lurgan, County Armagh. At approximately 12.40pm on the Monday the bomb exploded as the 40-year-old mother of three braked at the bottom of the street where she lived. At 3.10pm Rosemary Nelson was pronounced dead in hospital. She left behind a devastated family and a community in mourning. The news last week that Police Ombudsman Nuala O’Loan has found that the RUC failed to protect Rosemary Nelson has led to renewed calls for a full and independent inquiry into the human rights lawyer’s death to take place without delay. 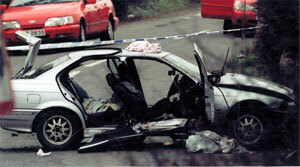 In her report, published on Wednesday 19 September, Nuala O’Loan found that death threats directed at Nelson, who was killed when a unionist paramilitary bomb exploded under her car in March 1999, “were not handled properly by the police”. The Ombudsman also revealed that the NIO failed to act properly over the threats as it failed to forward a letter and leaflet, which referred to Nelson, “in an abusive and inherently dangerous manner” to the RUC for investigation. The letter, which was sent to Rosemary Nelson at her home in Lurgan, County Armagh in June 1998 warned, “we have you in our sights RIP”, whereas the leaflet was widely circulated in the Portadown area in the summer of 1998 and carried Nelson’s address and telephone number. O’Loan’s report was the culmination of a seven-year investigation initiated in November 2000 when the Belfast based human rights watchdog, the Committee on the Administration of Justice (CAJ), asked the Police Ombudsman to investigate allegations that the RUC had not properly looked into threats directed at Rosemary Nelson. While the CAJ requested that the Ombudsman’s investigators probe four allegations, about how specific aspects of Nelson’s personal security was handled by the RUC, these were only the tip of the iceberg. Beginning in October 1996 Rosemary Nelson had received no less than 20 death threats most of which came from the various unionist paramilitary groups operating in and around North Armagh. These were 20 threats that Nelson and her associates took seriously. There were many others that she regarded as nothing more than the work of cranks and so disregarded them. However, Nelson had become a hate figure for the RUC and Special Branch interrogators began to target her. Therefore, in the same way that Special Branch interrogators issued threats against the Belfast-based defence lawyer Pat Finucane through his clients, the RUC in North Armagh let it be known that Rosemary Nelson was in their sights. In March 1998 on his release from Castlereagh Holding Centre one of Nelson’s clients informed her that his interrogators had referred to a law, enacted in 1989, to deal with solicitors who helped their clients. They were, of course alluding to the assassination of Pat Finucane who was shot dead by the UDA in February 1989. Brian Nelson, a British agent, planned the Finucane killing. Rosemary Nelson qualified with a law degree from Queens University in Belfast. She was a lawyer who was determined to represent her clients regardless of who they were. However, when she began to represent clients arrested under the Six Counties draconian emergency legislation she became a target for the RUC. Nelson defended Lurgan republican Colin Duffy who was wrongly convicted of killing of a member of the UDR. He was acquitted, eventually, on appeal when Nelson discovered that the main plank of the RUC’s case against Duffy was the perjured evidence of UVF commander Lindsay Robb. Robb, it turned out, was a Special Branch agent who would eventually be convicted of bringing guns into the North from Scotland at a time when he was involved, as a member of the PUP, in political talks with the British government. Nelson also took on the case of Robert Hamill. Hamill, a Catholic from the Obins Street area of Portadown was beaten to a pulp by a loyalist mob in the town in April 1997 and who died 10 days later. An RUC patrol witnessed the attack yet refused to intervene and it was this inaction, which became the focus of Nelson’s case on behalf of the Hamill family. Indeed three weeks before she was killed, the RUC refused Nelson permission to view CCTV tapes of the area where Robert Hamill was assaulted. Portadown was in turmoil in the middle years of the 1990s. The Orange Order demanded the right to parade along the nationalist Garvaghy Road. Garvaghy residents, in turn, demanded their right to live free from sectarian harassment and it was Rosemary Nelson who championed their cause. It was her willingness to stand on the principle that everyone had the right to be treated equally under the law and her bravery in standing by that principle that brought Rosemary Nelson into direct confrontation with the so-called defenders of law and order. The RUC hated Rosemary Nelson’s unswerving commitment to using the law for the benefit of her clients. In July 1997 as a huge force of British soldiers and RUC laid siege to the Garvaghy Road and forced an Orange march along the road Rosemary Nelson became the focus of RUC bigotry. She was physically attacked and had to endure a torrent of sectarian and sexual abuse as she, unflinchingly, confronted the riot squads. “There is a widely held belief that British state agents were directly involved in Rosemary Nelson’s murder. The Police Ombudsman’s report clearly highlights why there should be a full independent inquiry into Rosemary Nelson’s murder”.